Will megaconstellations cause a dangerous spike in orbital debris? It’s no secret the megaconstellations will have a dramatic impact on space traffic. Experts now are turning their attention to ensuring they don’t also create a dangerous spike in orbital debris. Dozens of companies around the world are planning constellations of tens, hundreds or thousands of Earth imaging, Internet-of-Things and communications satellites. Not all of them will succeed. Still, it’s clear there will be a significant escalation of the number of satellites in orbit, said Tommaso Sgobba, executive director of the International Association for the Advancement of Space Safety. There are about 1,900 active satellites in Earth orbit, according to the Union of Concerned Scientists. Megaconstellations could push that number close to 20,000 in the next decade. It’s not just the number of satellites that concerns debris experts. It’s also the concentration. SpaceX won U.S. Federal Communications Commission approval in March to launch 4,425 satellites into its Starlink broadband constellation to altitudes of 1,110 to 1,325 kilometers and is seeking permission this month for 7,518 more satellites in a so-called very low Earth orbit of 335 to 346 kilometers. OneWeb is asking the FCC to approve its plan to launch 1,980 broadband satellites to an altitude of 1,200 kilometers and 2,560 into medium Earth orbit. Satellite operators receive conjunction alerts when one of their satellites is likely to cross paths with another satellite or space debris. Traditionally, satellite operators analyzed those warnings, considered whether to move a spacecraft and if so, where. They also analyzed potential orbit maneuvers to make sure they weren’t putting a satellite on another collision course. This analysis, which can take a day or more, is too cumbersome for megaconstellations. Instead, they plan to automate many decisions as Iridium Communications has done with its 66-satellite global communications constellation. “For Iridium, conjunction [analysis] takes seconds; for others, it takes big chunks of peoples’ time,” Muelhaupt said. Both groups will need to find ways to coordinate and cooperate, said Travis Langster, Analytical Graphics Inc. business development vice president. Unlike large satellites built to last 15 years or more, the megaconstellations plan to rely on satellites designed to work for five to seven years. That strategy provides megaconstellations with a way to refresh technology in orbit. It also creates more traffic. Satellite operators, under existing Inter-Agency Space Debris Coordination Committee guidelines, are expected to deorbit satellites within 25 years of the end of their missions. A broadband constellation launching new satellites into low Earth orbit every five years, under the 25-year guideline, could put six generations of satellites into orbit before deorbiting the first generation. Megaconstellation developers planning to spend billions of dollars to build, launch and operate satellites generally support tighter rules on debris mitigation. OneWeb, for example, has announced plans to deorbit spent satellites within five years. 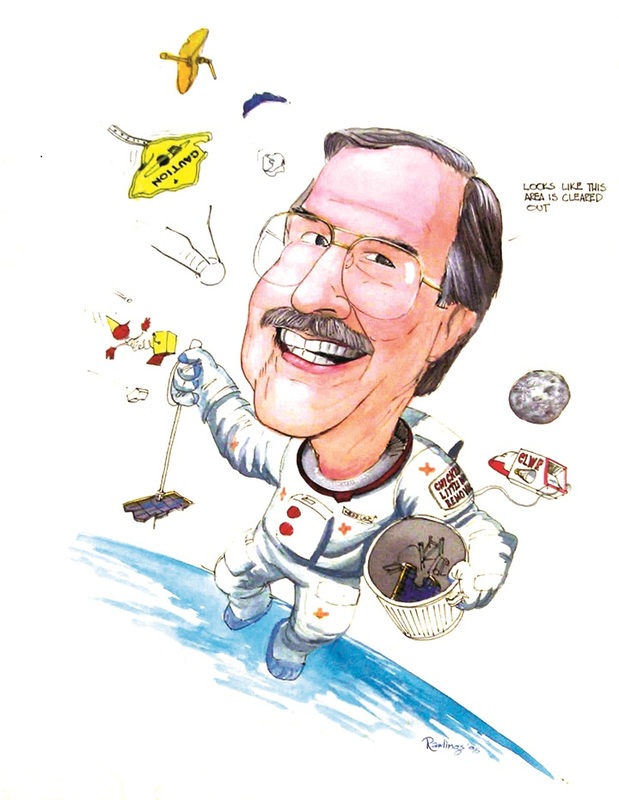 “No one has a higher vested interest in keeping their orbits clean than large constellations,” Muelhaupt said. At a recent conference, Muelhaupt spoke with a large constellation developer, who emphasized the importance of orbital debris mitigation. “He wanted people under control. He wanted people to be cooperating. He wanted people telling him what they were planning on doing so he could accommodate it,” Muelhaupt said. It’s not enough, however, for some megaconstellations to embrace the post-mission disposal rules OneWeb touts. Every large constellation must adopt the five-year rule to prevent a dramatic increase in orbital debris. That was a major takeaway from the “Large Constellation Study” published in September by NASA’s Orbital Debris Program Office at the Johnson Space Center in Houston. The authors relied on a simulation model to determine the impact of three megaconstellations operating thousands of 150-kilogram and 300-kilogram satellites at altitudes between 1,000 and 1,325 kilometers with different inclinations and orbital planes. The study assumed each satellite would be deployed at 500 kilometers, raise its altitude with onboard propulsion, operate for five years and then move out of orbit within five years of its mission’s conclusion. At that point, each satellite would be replaced by a new one. To prevent a serious long-term debris problem, 99 percent of the spacecraft must deorbit within five years after they complete operations, said Jer Chyi Liou, NASA Orbital Debris program manager. Achieving that level of post-mission disposal is complicated. Satellites and their key components, including batteries and propulsion tanks, must be reliable from the time they reach orbit through post-mission disposal. They need enough fuel to perform their end-of-life maneuvers and they need shielding to ensure micrometeoroids and orbital debris don’t compromise key components. How much shielding is enough? Only about 4 percent of objects greater than one centimeter orbiting Earth appear in the public catalog maintained by the U.S. Defense Department. “There are a lot of objects out there that are not being tracked that could cause catastrophic failure,” AGI’s Langster said. 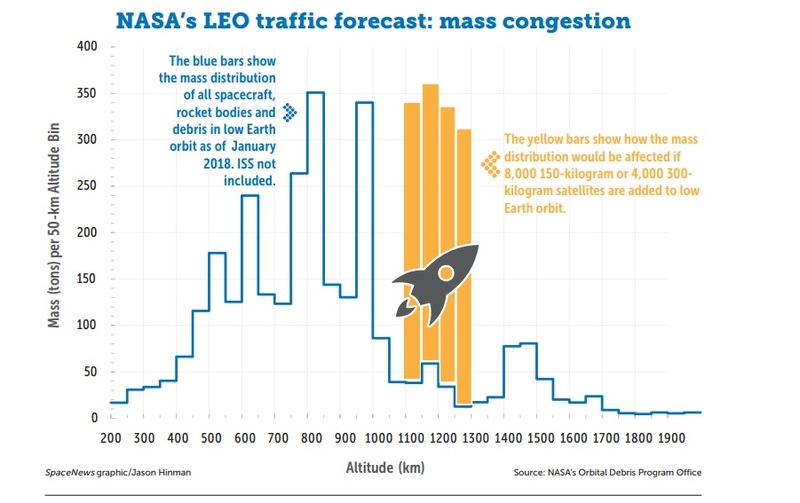 Debris experts are particularly concerned with the altitudes the megaconstellations plan to populate because anything circling Earth above 1,000 kilometers will take more than 1,000 years to reenter the atmosphere. 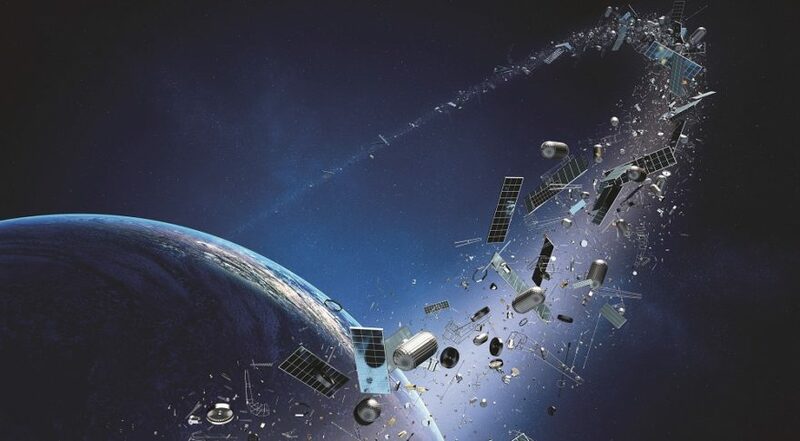 Companies building megaconstellations eager to avoid the disastrous cascade, known as the Kessler Syndrome, are vowing to adhere to strict debris mitigation guidelines. This article originally appeared in the Nov. 12, 2018 issue of SpaceNews magazine.